Despite repeated speeches to the contrary. Abenomics became the economic religion of Japan in later 2012, and “QQE” (Qualitative and Quantitative Easing) was an integral part of it. So has the “QQE Unwind” commenced? Are central bankers, even at the Bank of Japan, getting cold feet about the consequences? And “flexibility” has been proposed as solution to those concerns. The minutes reiterated that the BOJ would continue to buy Japanese Government Bonds (JGBs) in “a flexible manner” so that its holdings would increase by about ¥80 trillion a year. But this is precisely what has not been happening, in line with this “flexibility.” Over the past 12 months, the BOJ’s holdings of JGBs rose by “only” ¥26.2 trillion – not ¥80 trillion. And they declined in September from the prior month (more in a moment). The Fed has already whittled down its balance sheet by $285 billion since it started its QE unwind last October. The ECB has tapered its QE from a peak of buying €85 billion a month to buying €15 billion currently and will end it altogether in December. The discussion has switched to raising rates and unwinding QE. The BOJ has been buying mostly Japanese government securities (JGBs and short-term bills), but also equity ETFs, Japanese REITs, and corporate bonds. Japanese government securities are the largest asset class on the balance sheet. By now, the BOJ has acquired about 50% of all outstanding Japanese government debt — up from about 14% in late 2012. 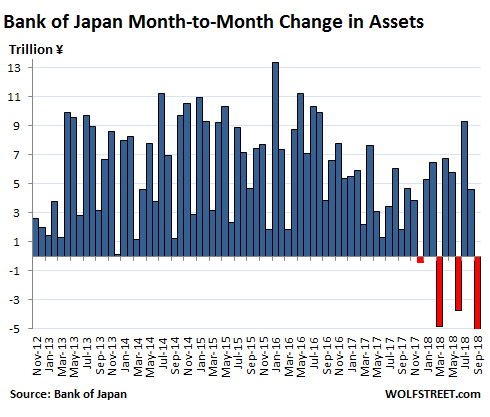 But the amount of these government securities on the BOJ’s balance sheet fell in September from the prior month, to ¥462.1 trillion. For the 12-month period ended September 30, the BOJ added “only” ¥26.2 trillion of these securities, down from around ¥85 trillion during the QQE peak years, and a far cry from its assertions, most recently made in the meeting minutes released in September, that it would add ¥80 trillion a year. In fact, it has not added ¥80 trillion in a 12-month period since the 12-month period ended April 2017. 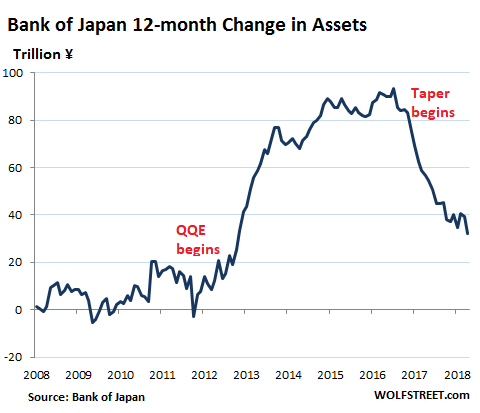 So whatever the BOJ may proclaim, it has been tapering its asset purchases, but not in any consistent manner, to keep everyone guessing. Japan, by far the most over-indebted country in the world in relationship to its economy, has decided that there will be no debt crisis. A debt crisis would force Japan to brutally cut its budget for social services and raise taxes by large amounts to make ends meet. Japan has decided that it would never come to that. Instead, there may be a currency crisis or an inflation crisis, or both, which would spread the pain more evenly. Japan can weather this type of crisis better than other countries because it has a large trade surplus and a large pile of foreign exchange reserves, though it would whittle down the wealth and purchasing power of the people. So this type of crisis will be kicked down the road for as long as possible. And that could be quite a while. What Japan will never have is a debt crisis since the government bond market is in total control of the BOJ. Given the extent of its control over the market, the BOJ can now ease up on buying these JGBs. But market forces will never be allowed mess with that market. Great article Wolf! This seems to be the future of US and Japan is basically an economic laboratory at the forefront. The question as always is: Why is Japan not hyperinflating? They’ve printed an ungodly amount of Yen? Is it just because of Trade surpluses? It appears to me that there will never be hyperinflation in any country as long as they are not import-dependent on too many commodities like Oil. Maybe officials in charge prefer controlled cycles of deflation vs out of control hyperinflation?? I would expect hyperinflation to be automatic simply because there is only so much real economic growth in domestic markets. Every earnings call probably doesn’t even make as much money but they stocks still hold value because BOJ buys them? That should encourage recklessness IMO. Hyperinflation is part a product of money supply, so what BoJ is doing is to support money supply into the economy, and to the population, where otherwise it would have decreased likely causing deflation. That doesn’t mean that supply of money is well allocated nescessarily. To put it into perspective, this way you could have the whole economy move on to paper only… pretend suppliers, pretend manufacturers etc…..but as long as the accounts were being written down and people being paid, well you have the same day to day money in circulation. Obviously if it reached that extreme there would be hyperinflation because everyone would be competing for the last auto to come off the assembly line, but in current reality there is seen to be “under valuation” or “over supply” etc. , so Abe is keeping the accounting and distribution more intact…does not mean it is a good thing or not, and it does not mean that imbalances might not build that could destabilise the whole framework. Deflation is natural and makes space for new investment, so the debate is maybe if there are larger paradigms at work in Japan that needed levelling, or if it has reached a sort of acceptable economic/social plateau, or if the BoJ is actually an impediment to better evolution – all subjective in a sense which is why it is a political and social direction as well. Just because BoJ sets the floor to prices, it does not follow that prices will jump for the ceiling, I am sure they try to monitor closely to make sure that there is no reason for a vast surplus of cash to be willing to drive up prices anywhere excessively. They will also be watching their international balance. So it is a sort of state remotely managed economy, but where it goes over the long run is pretty much a guess I think. The Japanese are organised and coherent amongst themselves and so the structure of management is there, I am not sure other countries would be anything as successful at the above, where individualism and competition, rebelliousness, independence, past argument, and so on are much more common. Just looked up their inflation rate – about 1% on average over the last year. Apparently, one can have the cake (printing money) and eat it too (no inflation). QQE goes into financial products and is money spent by the Central Bank. When the Government starts buying real-world, physical products the inflation will come. But Japan has a trade surplus so it has a buffer. I think to get hyperinflation, there need to be a loss of faith. As long as one can buy pretty much the same tomorrow with the money one has today, faith is preserved. And in the western world today one can even buy nicer things tomorrow with today’s money, which is one of the reasons that even normal inflation won’t readily kick off. “Inflation is when people want more and more money for their goods and services. Depends a lot on where the money goes. If it simply goes into the excess reserves of a few large financial institutions on deposit at the Fed, as what happened to most of the QE money in the US, then it does nothing. It doesn’t stimulate the economy and it is not inflationary. If the people have a high propensity to save, then whatever money they get goes to debt reduction and savings, and again neither stimulates the economy nor creates inflation. Hyperinflation most often involves debt in foreign currencies, and/or a current account deficit. It matters a lot where the increase in the money supply goes. If it is simply parked somewhere to satisfy new reserve requirements or capital ratios, then there will be no inflation. If it goes into the asset markets, you might get a stock market bubble or a Real Estate bubble, but no increase in consumer prices. The problem is that if the money supply increase is being “consumed” by a reduction in the velocity of money, they you are creating a situation in which, when the velocity returns to normal, the consumer prices will spike up. I have not been able to come up with a definite answer to these questions, but changes in the propensity to save certainly could cause strange, non-linear changes in the price level. Why exactly do you think that Japan should be hyperinflating? Has it occurred to you that the fact that they’re barely inflating, means that actually they haven’t “printed” enough Yen rather than the opposite, or that the Yen that they have “printed” remains at the “vault” of the central-bank (i.e. outside the economy)? That, or the general population can clamor for the BoJ to simply meet the Finance Ministry’s obligations to its bondholders each payment. No cuts or tax hikes required. Currency isn’t scarce; there’s never not enough money for a government to do something if the actual resources are available. Yes, at one time actual resources needed to be available, first trees and ink, then thin air, and now digital computing power. It just takes a keystroke to unleash $trillions. Not just a keystroke – it also takes ceding of democratic power to greedy financiers, who are allowed to do this and little oversight applied. Central banks are after all independent of the political process – but staffed by people very much with an agenda (the advancement of neoliberalism – the ‘final solution’ and the end of history) and an eye on their own future and stock portfolio. Do you see this hypothesis applying to the US as well considering we are still masters of the global currency? How do you see this crisis playing out in the US? It’s a gigantic problem unless everybody realizes it totally doesn’t have to be. And that goes for any developed country. Money doesn’t have to be sucked out of any existing account to pay a debt. Debt crises are purely artificial problems people with real power either want the rest of us to have, or which they will insist on inflicting on us regardless, because they don’t know what the hell fiat currency actually liberates a country without scarce resources to do. Wolf, for a country that has had a stable currency since the end of WWII, and has also appreciated, this is financial engineering or magic. Correct me if I’m wrong, but it seems to me that Japan is a pass through country that has very little natural resources but has expert skills to purchase resources, including labor, from other countries add value and then sell it in global markets. They do this while the BOJ manages their currency and the home economy. Magic? Japan has reached a demographic impasse because young people don’t see any clear path to economic success. Working for one company until retirement doesn’t work anymore. Japan is not as bad as the USA, but it’s still a bad bet to work for a single company for 40 years and then hope and pray that the pension fund doesn’t empty out before you die. Consider Sears and GE, two American icons that are either about to file for bankruptcy, or else have billions of dollars in underfunding of pensions to correct. Because young people have no confidence in the future, they are not having children. Japan’s population is expected to shrink from 127 million in 2014 to 97 million in 2050. Their total fertility rate (tfr) is about 1.41 per woman, it needs to be 2.08 to have zero population growth rather than a decline. The US has adopted similar policies and our tfr is now at 1.76 and still falling. This lack of confidence in turn becomes a self-fulfilling prophecy, because a shrinking population implies a shrinking economy, in the long run. It appears that much like the titan Cronus, our central banks are devouring their young, except that they are even worse, because they are doing it before they are even born. When I was born, there were 2.5 billion people on this planet. Now there are 7.5 billion. This is a self-destructive path. The only way forward for mankind is to halt this endless multiplication of the population. What the Japanese are doing is a good thing. Other countries and populations are doing it too. They get it. An economy should be looked at on a per-capita basis. And a declining population sees to it that on a per-capita basis, the individual PEOPLE (not the banks and corporations) are doing well. See Japan. In simple English would it mean that BOJ will just print to service its debt? In simple English how does the trade surplus help weather a debt crisis? 1. Japan is experiencing deflation. This means, banks give zero to negative interests on savings accounts. So people pull out their cash and put it in a safe (or just keep it in a checking account). There is more money to be made by not investing. I could be wrong but I think exporting kept Japanese industries (and thus Japanese companies, GDP and inflation) alive. There is surely not as much domestic demand for products since saving = getting rich. Wolf isn’t saying a surplus helps with a debt crisis. He’s saying it will avoid THAT at all costs and instead try to weather a currency crisis. It can put such a crisis off for a while because it’s surplus means that the rest of the world is buying it’s goods, which means they convert into Yen, which therefore puts upward pressure on the Yen. That is a very stealthy stealth taper they have going there. However Japan is much more homogeneous and disciplined as a society I think. In Europe we got to Draghi does Nicosia and Troika does Athens and now they find everywhere they go shuttered up by the time they get there…no Euros round here nosiree….so they just went home and flipped rates negative to pay themselves and have not been seen since. also, the eu doesn’t issue bonds. the ecb holds the individual member countries’ bonds. that makes everything more complicated. The original capital ratio of each country at the ECB is used to calculate how QE government bond purchases are allocated (in proportion to that ratio) , but for the ECB it is not complicated, it just buys them. What is complicated however is many different countries in different economic circumstance having their rates and fiscal policy set within a narrow one size suits margin. If you imagine all the countries in north and south America having their rates set at the same level by one central bank, and being told that they must keep spending ( deficit and debt to gdp) below certain levels or be punished (bankrupted basically) and that they go bankrupt like that anyway, and that they are told they cannot leave, and their societies suffer, and they get insulted by their neighbours at the same time… well it makes complicated sounds romantic. which is claiming the open calendar of “sometime after next summer” for any rate rises is setting up property poperty 2.0 , and even mentions that the people in Frankfurt know this and say it will happen. Either they are out to talk the market down (but most of the south does not speak German and negative opinion like this is usually rejected ) or they have decided they might as well bring in their mea culpa from the future and throw it in with all the forward spending… will probably appear on ATM screens eventually. Recent data from Japan is not encouraging. With a government gross debt to GDP ratio of 253 percent, Japan has the unwanted title of ranking highest in the developed world. The recent budget requests by Japan’s central government ministries and agencies for fiscal 2019 total a record-high 102.77 trillion yen. Japan’s trade balance has again swung into deficit territory and a matter that has not garnered enough attention is how the economic problems that continue to develop in China will most likely spill over and affect Japan. It’s articles like these that make this site stand out from others. A lot of other writers will say the Fed is tapering 50 billion a month without delving into the details of how the precise amounts that will be maturing on the 15th and 31st of a given month. 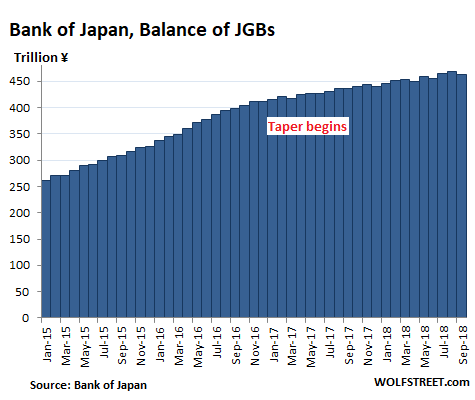 Likewise, I’ve read about Japan’s QE tapering elsewhere, but Wolf goes a step further and details the exact amount of tapering along with the source of the information. Thanks for your fantastic effort. Because the most over-indebted country in the World in relationship to its economy is the United States of America. Only the Dollar scam is keeping it afloat… for now. Dollar scam? The scam is working great – the USD is up big time this week in its drive upwards. Everyone wants USD and no one wants Gold or Silver. No one wants gold and silver. Let me repeat “ no one”. In terms of debt-to-GDP, a common measure of this, the US is at 106% and Japan at 250% (based on my memory). There may be other measures, but by this measure, Japan has all of them beaten hands-down. The US-Japan comparison depends on how honest each nation is about “government debt”. In the US, we do not aggregate all government debts (which includes state, county, municipal levels) nor their pension debts, nor the broader problem of social security and medicare sustainability. Adding in the muni bond market and the public pension shortfall and so on would kick the US number up from 106% to over 150%, possibly 200% with SS/Medicare. Not sure what is counted in Japan’s “250%”, but I believe most nations with monolithic governments aggregate all debts. Japan certainly has issues, though, because even at very low interest rates, the interest cost on that debt eats up about half of the government revenue. Of course, with BOJ possibly remitting much of that back to the government, who knows? Without “market forces”, it ain’t really a market! It’s a government store. The BOJ used QE to bailout Japanese businesses to keep them producing income. Now that the Japanese economy is improving they are pulling back. The biggest difference between the BOJ and the Fed is that Japan bailed out the entire commercial sector and the Fed only bailed out the banking system. This was possible because household debt in Japan is almost non existent and in the US it is multiples of median income. The current figures are US$3K in Japan vs US$137K in the US. The Japanese government and the local banks have been keeping afloat many companies… for decades, really. To give an example Mitsubishi Bank (now Mitsubishi UFJ) kept Akai Electric alive for over two decades until they managed to find a foreign buyer in 2004, as no domestic company wanted to “merge” (mergers in Japan are such bizarre affairs they would deserve their own rather thick book) with Akai, or even touch it with a very long pole. 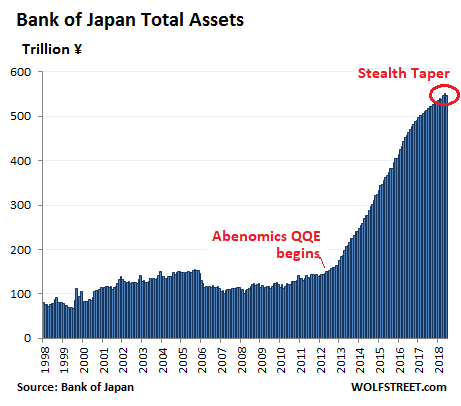 As in the rest of the world the financial manipulations of the Bank of Japan had nothing to do with “saving the economy”: like many other countries Japan has plenty of well run, profitable companies which would do very well without QE. Shin Etsu, Fumakilla, SUMCO, Ajinomoto, Bridgestone, Toyota… you name them. But these financial manipulations have a lot to do with enabling massive deficit spending by the government to prop up the other companies, those that would have to radically change their ways or even go to the bankruptcy court, which in Japan is a massive no-no. To give an example, the Japanese government is presently building a high speed maglev “railway” solely as a make-work project for local ailing companies such as scandal-plagued Toshiba and their legions of contractors. Japan has no need for the “chuo shinkansen”, as it is named: her railways work well as they do. But a public work project with a budget measured in trillions of yen allows a lot financial zombies and poorly run companies to put the day of reckoning into the future: the ferocious “squeezing” Japanese keiretsu put their vendors and contractors through when manufacturing cars, motorcycles and escavators for the private sector doesn’t apply to public contracts. How many times has the US government helped General Motors aka GM by now? That company has been rescued more than once by the good old USA. Let’s face it without government help GM should have died decades ago. The US government “corporate welfare” program depends very much on the political climate of the moment, and that climate in a democracy is always shifting. Relying on it is basically like visiting the casino: the outcome is far from certain. Better to cash in the free chips and run to the bank when there’s the occasion. British car and motorcycle manufacturers relied on the government to bail them out when their German and Japanese competitors started to pound them into dust. It worked for a while, until the political climate in Britain shifted and HM Government decided to reel the lifeline in. If you want to know why Margaret Thatcher is still so hated, look no further than this: she’s but the best known of the politicians who decided to shut off the taps, thus killing off a lot of “cushy” and “for life” jobs. That’s also the reason the Iron Lady will always have my grudging respect: it takes a lot of courage and an unbending will to do that in a democracy. As I was told when I started dealing with Japanese companies “In Japan things are always a little different”. Even the character of the Japanese democracy is a little different. While there have been laudable, albeit ultimately unsuccessful, attempts to cut down on corporate welfare, it remains one of the economic pillars upon which Japan is built. To give an example in 2009 JAL (Japan Air Lines) stood on the brink of bankruptcy. Had it been a Western company it would have taken the book to courts and, given how it burned through the Y100 billion lifeline the government threw it right away, it would not have emerged from it, at least not in the same shape. That’s how bad things were. 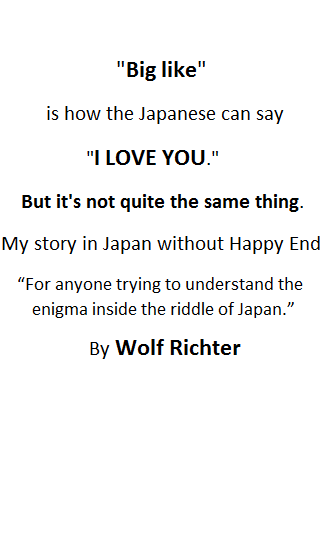 What followed is an example of how things are “always a little different in Japan”. Besides everything else, cabinet ministers (including the infamous Seiji Maehara, who was later forced to resign due to suspect bribery from foreign nationals) personally visited Kazuo Inamori, the founder of Kyocera and a legendary management guru, to come out of semi-retirement and become the new JAL CEO. That these powerful politicians patiently lined at the door of one of Japan’s most revered corporate figure, and one of the few survivors of the post-WWII generation of economic legends which included Soichiro Honda, Konosuke Matsushita and Takeo Fujisawa, says it all in my opinion: no Western politician would want to be seen as a mere supplicant. You have debt you have a debt crisis, a trade surplus is not written in stone, the value of foreign exchange reserves can be marked to market. What fools imagine that Fx is a zero sum game and currency in the global aggregate cannot lose value?! Like China, the Japanese have a backward society. And like the US GOP Congress they will find out sooner or later that if you want to live in the 19th century you better find another planet. Japanese people are relatively bright in terms of math and they can foresee disaster if they embark on a regime of central bank rate increases and the corollary hyperinflation that would naturally follow. As Keynesians, Japan has opted for eternal can kicking down the road as their only pragmatic option due to having the largest debt-to-gdp amongst first world nations. Moreover, Japan’s Finance professionals are seasoned enough to grasp the reality of the debt and what that debt can & can’t do for Japan, and the world. Japan is also a lynch pin of Financialization throughout the Western empire of banking. If Japan unilaterally acted to pivot from their eternal can kicking down the eternal road to financial Hell in a hand basket we would evidence the complete destruction of what remains of a world economy in that very instant of decision making. Japan is the prototype of Keynesian governance taken to extreme. America is sitting on the precipice of becoming Japan in short order as soon as Powell decides to re-embark on QE after he pushes rates high enough to evidence economic collapse. When collapse manifests Powell will quickly cut the rate again and reintroduce QE across the Western Banking System. At that juncture the newspeak will be that the ‘Central Bankers have saved the world again’, and we will proceed closer to Thermonuclear ‘Hot’ World War Three by evidencing further military incursions into the EU block countries due to juxtaposition between the Russian Federation & NATO interests in the region. Everything Powell does in the future will be evidence that the USA & EU Financial Systems are collapsing due to systemic & endemic financial unsustainability across the board from the third world to the first world economies. As Powell raises rates through 2019 we will all see him reverse course somewhere along that timeline. Looking down the road for hazards is elementary. More than thousands of hazards are now out there to disrupt the intentionality expressed by the FED over the last decade. In brief, this is all just one BIG experiment that was launched in 08, but Japan has been doing this sort of thing much longer than everyone else in the world to date. Japan is an experiment and so too is the USA & EU. From a standpoint of Engineering all nations are poorly represented structurally & architecturally with a Fractional Reserve Banking System when it can be shown to be unsustainable over time due to debt accumulation & deficit spending into a future that is illusory. Yes and we always tend to place more credence on the stability of these linchpins in ‘experimental’ systems, because we NEED to, just as we accept the data from behind the Chinese Firewall, as credible. Their lack of transparency makes us feel MORE secure, and leaders who lie blatantly seem more truthful. I wanted to ask Wolf, “have you been jawboned?” in regards to Powell’s steamroller. The illusions fall apart quickly, the is next debt ceiling debate. Just move a few seats in Congress and watch the obstructionists return with a vengeance. It’s time to start paying attention to fiscal probity (debt), and geopolitical conflicts, though we have been floating above the melee for a while. Interesting how the DOW & S&P crashed today, eh. Powell intends on riding the wave down and up again. Everybody is trying to build up ammunition for the next crisis. CBs don’t want to be caught with their pants down when it comes. In your most recent article, you mentioned that the BOJ has purchased 50 percent of all outstanding Japanese Government Debt. Could you please explain in an article how they possibly could have done that without triggering massive inflation. Also, please lay out why you would expect the same or a different outcome here if the Fed were to aggressively renew QE. I assume since you once lived in Japan for a time you will have some unique insight. I believe in the “market,” not the “free market” like most people like to call it. Japan and US cannot kick the debt/inflate securities can down the road indefinitely. Eventually, there will come a reckoning and the market will prevail. When market forces incite Japan CB to off load equities it may not push prices super lower but it will cause massive volatility like you haven’t seen before. What does this have to do with this thread? I’m not sure, just thinking out loud. I was under the impression that BOJ now owns not only a majority (85%) ?of government debt but a similar proportion of private zombie debt .. when they get to the point of owning everything in japan maybe they will be a modern capitalist/communist country..
Yeah, but how is Japan going to solve its fundamental demographic problem (without large scale immigration)? Japan’s big urban areas are immensely crowded, stuffed with tiny homes. Trains are packed. Commutes are long. There’s a reason why the Japanese people decided to stop this endless population growth nonsense — as have many other countries. Quit worrying about the Japanese population. Once they have a little breathing room, they’ll maintain their population at whatever lower number they choose. Japan has the fastest GDP growth per working person in the world. They don’t need more people. Japan is one of the few countries able to deal with automation without creating a sea of unemployed. I’m guess the answer is “no” but does the BoJ do any mark-to-market accounting on their JGBs? If so, then a BS reduction is not the same thing as withdrawing stimulus….but I don’t know of any CBs that M-T-M so I’m guessing that the BoJ doesn’t either. No mark-to-market accounting. They hold JGBs to maturity. When they’re redeemed, they get face value for them. So there are no losses associated with JGBs for the BOJ, and therefore no need to mark-to-market.